Representatives from the Brics countries said on Thursday that global trade was "facing unprecedented challenges" and urged World Trade Organisation members to honour their commitments to the multilateral trading system. The call is included in the Johannesburg Declaration that was adopted by the grouping of five emerging economies - Brazil, Russia, India, China and South Africa - on Thursday afternoon. The declaration comes as the US and China remain deadlocked in a trade war over tariffs. The tariff dispute between the world's two largest economies has been spearheaded by US President Donald Trump, whose first term in the Oval Office has seen a pronounced shift towards protectionism - the cushioning of a country's industries against foreign competition by taxing imports - for the United States. The declaration from the Brics bloc representatives said they recognised that the multilateral trading system was facing unprecedented challenges. The countries said they recognised the importance of an open world economy, which should be inclusive and support sustainable development and prosperity of all countries. "We call on all WTO members to abide by WTO rules and honour their commitments in the multilateral trading system," the declaration said. The US has over the last few months slapped a series of tariffs on Chinese imports, including steel, aluminium and other industrial goods. 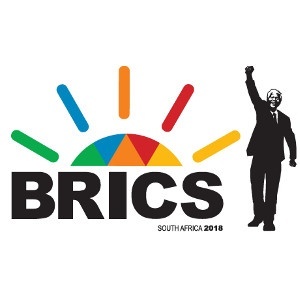 The Brics leaders have used the summit to reject the growing unilateralism, calling stronger intra-trade within members states. "We stress the importance of enhancing Brics financial cooperation to better serve the real economy and meet the development needs of Brics countries," read the document. The leaders hailed advances made by the New Development Bank, a brainchild of Brics, which was formed in 2014 as a vehicle for multilateral development and an alternative model for funding. The bank has so far disbursed nearly $500million in loans to South Africa. The countries also recognised the "long-lasting" impact of the scourge of corruption, saying it discourages investment. They committed to cooperate in anti-corruption law enforcement, extradition of fugitives, economic and corruption offenders and repatriation, including the recovery of ill-gotten gains. "We note with satisfaction the progress achieved on establishing the Brics local currency bond fund and look forward to starting its operation." The grouping noted the improvement in the global economy, adding that some risks still remained, including the challenges of "rising trade conflicts, geopolitical risks, commodity price volatility, high private and public indebtedness, inequality and a lack of sufficiently inclusive growth". The summit which concludes on Friday, also saw the signing of a Memorandum of Understanding on environmental cooperation, aviation and an agreement between Brazil and the New Development Bank on the establishment of the bank’s branch in Sao Paulo.